Pink Elephant Airport Parking is a good choice for travellers who want affordable Melbourne parking. It’s 5 minutes from Tullamarine Airport and open 7 days a week. There’s a free shuttle service that conveniently takes you to and from your terminal. Security is tight, so you can be confident leaving your car in their indoor parking facility. Competitively-priced long and short-term parking is on offer for all vehicle types. The firm offers services like mechanical repairs, car cleaning and vehicle handbook servicing. Trained staff can complete these tweaks while you’re on holiday — you might feel like you’re driving a new car on your way home! Pink Elephant Airport customers tend to trumpet their friendly service. So, if you want cost-effective parking at Melbourne with a personal touch, look no further. Pink Elephant Airport Parking is open from 5:00am-Midnight. However, they cannot take bookings or returns after 11.30 pm due to time required for pickup and drop off. As well as Melbourne Airport parking, Pink also offer automotive cleaning and detailing services and mechanical servicing for your convenience. Return from your holiday or business trip to a clean and mechanically sound vehicle saving you time and stress. 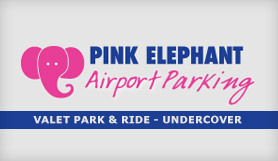 We recommend that you arrive at Pink Elephant Airport Parking base at least 45 minutes prior to check in closing. The trip to Melbourne Airport usually takes around 5 minutes, however we recommend you leave extra time to allow for traffic at Melbourne Airport. When you arrive at Pink Elephant Airport Parking base, simply park your car in one of the marked spaces at the front of the building and enter reception. Our reception staff will then get you to sign your receipt and promptly transfer you to Melbourne Airport. When you return to Melbourne Airport, have collected your luggage and/or cleared all stages of immigration/customs (for International passengers) then simply call on Pink on the number provided in your confirmation email. You will be instructed which bus zone to wait in and then you will be collected in a Pink Elephant Airport Parking shuttle.